On Oct. 7, one day after Reuters first reported the alleged murder of Saudi journalist Jamal Khashoggi, who Turkish officials later said was tortured and dismembered by Saudi agents in the Saudi Arabian consulate in Istanbul, Head of Saudi Arabia’s General Sport Authority Turki Al-Alshaikh announced Rafael Nadal and Novak Djokovic would play each other in December in an exhibition event called the King Salman Tennis Championship. The planning for the match preceded Khashoggi’s disappearance, but the timing hardly seemed coincidental, especially given Saudi Arabia’s recent strategy of using sports to bolster its reputation on the world stage. Nadal and Novak followed up with their own standard and probably contractually obligated tweets. Authoritarian regimes have long used sports, both domestic and international, as tools to curry political favor and appear palatable on the global stage. Saudi Arabia is no different. As Karim Zidan wrote on Deadspin earlier this year, the country began pouring money into a program called the “Sports Development Fund” in 2016, which aimed to increase sports in Saudi Arabia and use them to generate positive global press. The program resulted in Saudi Arabia hosting its first motorsport race in February and its first international boxing event in May. But as Zidan reported, the seemingly liberal notion of promoting international sports in Saudi Arabia belies the absence of any meaningful reform in the strictly repressive country. So, last week, with Saudi Arabia facing perhaps the most intense global scrutiny in recent years, the country’s attempts to use sports as some kind of damage control mechanism were especially jarring. While more than a dozen companies and media organizations—who were apparently previously okay with Saudi Arabia’s ongoing “intervention” in Yemen, which has left thousands of civilians and children dead—have ended their various partnerships with the government of Saudi Arabia in the past week, the sports entities who have partnered with the deep-pocketed kingdom evidently have no such qualms. Since the news about Khashoggi broke, there have been three major international sports happening or scheduled in Saudi Arabia: The tennis exhibition match, WWE’s upcoming show slated for November, and a series of exhibition soccer matches between Saudi Arabia, Iraq, Brazil, and Argentina, which started last Thursday and will finish Tuesday. The national teams seem unlikely to leave the stupidly named “Superclásico” early. WWE, despite public pressure (from people such as John Oliver and Sen. Richard Blumenthal) to withdraw from its upcoming show in Saudi Arabia, has so far stuck to the schedule. 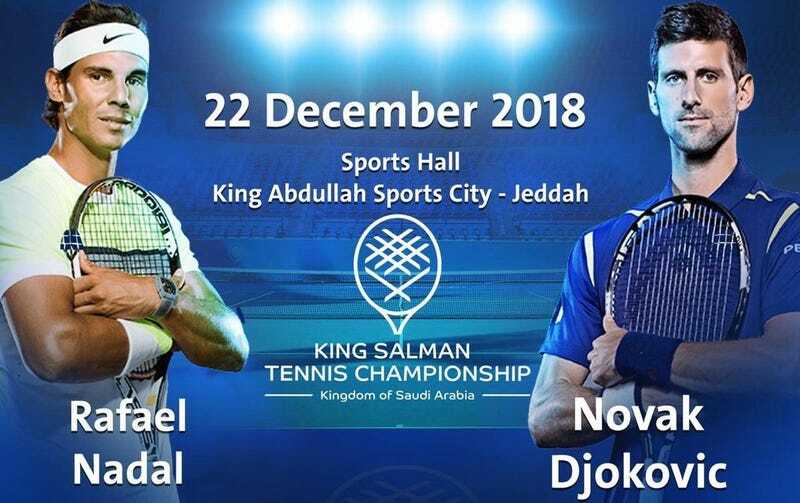 Rafael Nadal and Novak Djokovic, two incredibly popular athletes who don’t need to consult with teammates or colleagues in order to make a decision about their participation, are in the ideal position to pull out of the match and make a statement about how the world should view Saudi Arabia’s pattern of state-sanctioned killing. The question is if they mind being shiny baubles, dangled in front of the country to distract from a murderous regime, or not.